For its occasion of its 80th anniversary, which has kicked off this week, Pininfarina has given itself an all-new "Collection", the result of a restyling project by the Pininfarina Extra team. 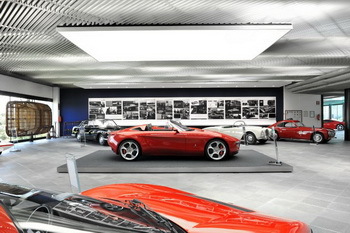 The Collection is the true custodian of the company’s values, and the "visiting card" with which Pininfarina will present itself to guests, the place where past, present and future blend, conveying to visitors all the magic of the Pininfarina brand. It has been updated as part of the company strategy to raise the prestige of the brand even higher. The cars on display are among the most significant of the hundreds that have written the company’s history, from the Cisitalia to the Alfa Romeo Giulietta Spider, the Sigma Grand Prix prototype and the Maserati Birdcage 75th. At the centre, the star of the exhibition, is Pininfarina’s latest creation: the 2uettottanta, a 2-seater open sports car that was presented at the 2010 Geneva Motor Show. The layout of the main exhibition has been rearranged to enable visitors to really appreciate the design excellence that has made the Pininfarina name famous the world over. New interactive display panels link the milestones of the past and project them into the future, with the perspective vision typical of a company that is eminently innovative and creative. 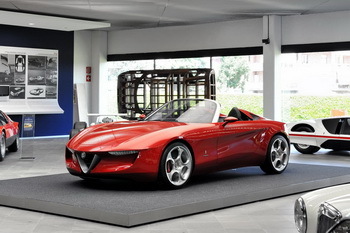 A show window enables visitors to admire articles designed expressly for fans of the Pininfarina brand. 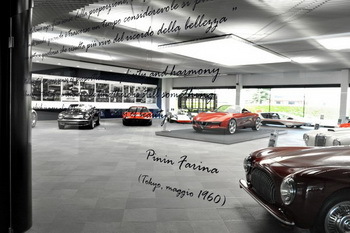 This display contains awards won by the company, publications that illustrate the company’s history and products, and some of the items designed recently for its clients by Pininfarina Extra, but also articles that are exclusive to the Collection. The Pininfarina Collection reflects the evolution of the company from its foundation to the present day, constantly aware of its roots and of the culture of its products and quality. The Collection includes about forty important models from the 1940s to the present, exhibited on a rotation basis, in a space that is deliberately kept small to highlight the quality rather than the quantity of the items on show: it is a selection of historical cars, one-off models, small production runs and mass-produced models, styling models and research prototypes, each with a specific creative, technical and industrial significance. 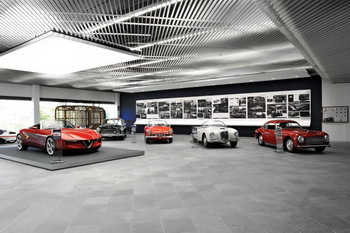 Some examples include the Cisitalia 202 Berlinetta of 1947, marking the international consecration as a designer of the Founder “Pinin” Farina, and the first car in the world to become a permanent exhibit in a Modern Art Gallery, the MOMA of New York; the Lancia Florida II of 1957, the Founder’s personal car for almost ten years up to his death; the Alfa Romeo Giulietta Spider of 1954, the car which, more than any other, represents the watershed between Pininfarina’s artisan past and industrial present; the Fiat 124 Sport Spider, which immediately became one of Pininfarina’s most successful cars, as in the end 200,000 examples were built, while it exported to America on a large scale; the Maserati Birdcage 75th, a prototype developed jointly with Maserati and Motorola for Pininfarina’s 75th anniversary, which was voted the “Best Concept” by the American magazine Autoweek, included on the Forbes list of the ten “coolest concept cars” of 2005 and winner of the Louis Vuitton Classic Concept Award in 2005. The display also includes the styling models for the most recent projects created by Pininfarina for prestigious clients, like the Ferrari 458 Italia and Maserati GranCabrio. The rotation of the models is not due solely to the inevitable need to maintain the cars and the desire to periodically update the message of the display; it is also a response to the continuous requests that come in from all over the world for cars to participate in cultural events in the design field, and automotive events in particular. For example, the Sintesi of 2008, is currently the star of an exhibition in Belgium, while the Ferrari P6 is about to leave for Korea.